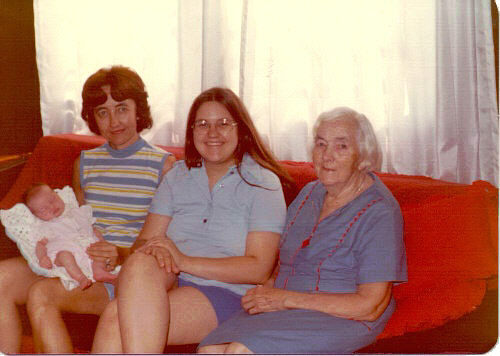 THIS PICTURE WAS TAKEN IN THE SUMMER OF 1979 AT MARYANNE'S MOBILE HOME ON WOLF LAKE, MATTAWAN, MI., JUST AFTER KIM WAS BORN. PICTURED FROM LT. TO RT. ARE KIM, JEANIE, MARYANNE, AND ALICE. ISN'T IT GREAT TO SEE OUR FUTURE GENERATIONS. NOW, KIM IS A NEW MOM WITH A DAUGHTER NAMED KAYLEE.